February SHOULD be the hottest month of the year, however, here in Wellington the hot weather (with temperatures of 25C+ every day and strange skies) have been replaced by blue skies and weather like we would see in March or even in April. Three bursts of tropical weather north of New Zealand could pose a threat to the country, a forecaster has warned. Weather Watch said the threat of a tropical storm or cyclone is "significantly increasing" north of New Zealand for the next 14 days. There are lows developing around Fiji which are expected to drift past north eastern New Zealand on Sunday, Monday and Tuesday, which may bring heavy rain. These lows are expected to remain offshore however, as Weather Watch reports the lows may briefly become a tropical cyclone in the area they're in. 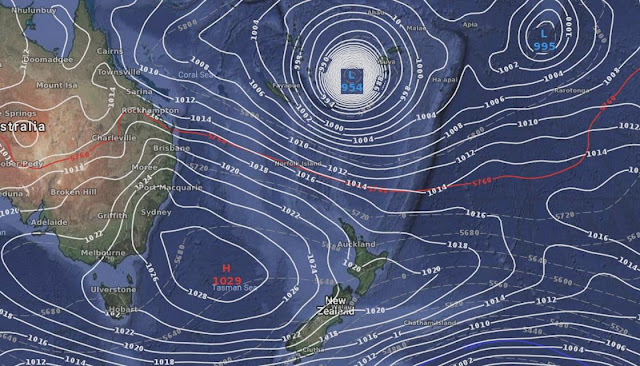 A larger low also appears to be moving towards New Zealand from the direction of New Caledonia. It has the potential to become a storm and a cyclone, but Weather Watch says it may stall ahead of reaching New Zealand. The biggest low of them all, a potential severe tropical cyclone, may form east of Fiji next weekend, Weather Watch has warned, and it could then deepen the following week. However, it's still too early to confirm the threat, the forecaster says, and at this stage "only US data is showing this as likely". Weather Watch says there is currently no direct threat to New Zealand by a tropical storm, but the weather "does look to be influenced by the tropical unrest developing". On the bright side, wet weather could bring some relief for those in Tasman battling a massive wildfire that's grown to 2000 hectares.